Remove the screw from the knuckle using a flat tip screwdriver. Pull out the right hand rim end from the knuckle and mark the base of the rim end with a black marker (this may have been done for you during manufacture). 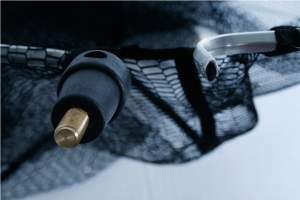 Once you have fed the net bag onto the rim and replaced the ring in the same position you must insert the rim end with the black mark into the right hand knuckle hole. 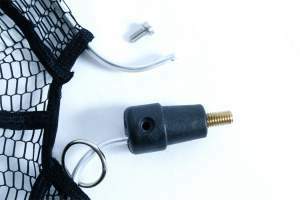 Before you insert the screw you must ensure that the rim is fully inserted into the knuckle and you see a continuous ‘thread’ for the screw to follow.